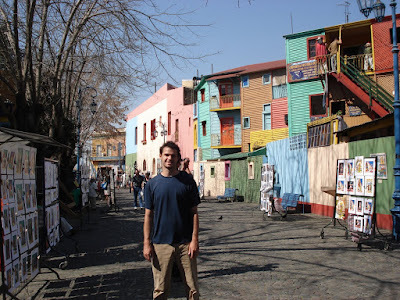 We're not sure if it was the food, the beautiful buildings, or the extremely favorable exchange rate, but we immediately fell in love with Buenos Aires. The city is made up of distinct neighborhoods, each with its own character, in a way that reminded us of Boston. Bohemian Palermo Viejo is filled with chic clothing boutiques and outdoor restaurants. San Telmo has a very European feel with its cobblestone streets, colonial architecture, and central plaza that hosts a massive flea market every Sunday. And the port enclave of Boca marked by its vibrantly colorful buildings, painted with leftovers from the ships that dock there, is so surreal it looks almost like it belongs in Disney World. Unfortunately the residents have realized this appeal and it's impossible to walk down the street in Boca without aggressive invitations to shops, restaurants, or for a photo in a cheesy tango cutout. The best part about visiting each neighborhood is that the City of Buenos Aires has installed signs at notable landmarks with a map of your location in the neighborhood on one side and a diagram of the particular landmark you are at on the other. Both sides have translations in three languages (including English) as well as a 5 digit number you can call on your cell phone for presumably an audio description to be read to you. The neighborhood in which we stayed was the Avenida de Mayo. This tree-lined main boulevard runs from the National Congress to the Casa Rosada (or Pink House, which is Argentina's equivalent of the White House) and is notorious for its political demonstrations. We witnessed plenty of them during our stay--from parades down the avenue with m usic and balloons to camp-out like protests on the park in front of Casa Rosada. It seemed like something was always going on, even a movie filming one night. Touring the historical buildings on either end of the Avenida de Mayo is surprisingly free, but they are only open during certain hours and only as part of a group tour led by a provided guide. The English tours are scarce so we smiled and nodded our way through a tour at each place in Spanish . Luckily Patrick was able to pick up a good portion of the information about the Argentinian political system to fill in Katrina later. On the Plaza de Mayo there is also the Revolution Museum to visit (which costs 1 peso or 25 U.S. cents but is less interesting if you can't read the Spanish descriptions of the various exhibits) and the National Cathedral where Argentina's George Washington, General San Martin, is buried. The beautiful tiling alone makes the cathedral worth a visit. Another great thing about the city is that there is no need to visit an art museum because around every street corner there seems to be a beautiful work of art, whether it be a statue, mural, or mosaic. Our hotel, the Cecil, is well located right on the Avenida de Mayo. The huge door to our room, unlocked by old school key, opened to reveal a rundown space with lots of...um...let's call it character. The sheets and towels all bore the Cecil Hotel monogram, but hadn't been updated in likely a decade or three. The ceiling fan noisily rocked with each rotation. And our favorite was that the entire bathroom with bidet became the shower when you turned on the head in the middle of the room--which we found pleasantly spacious, but just had to remember to keep the toilet paper in the bedroom while showering! The lack of a window just added to the musty charm. We also had free wifi and a TV that got more English channels than we used to get at home. Quite a steal for $25 per night. We loved every minute of our stay in room uno uno uno, probably our favorite accommodations of the trip so far. It also helped that two blocks away was a fantastic pastry shop, Piazza de Buenos Aires. On more than one morning we went in to point and choose a collection of pastries priced at $3.50 per dozen. Even better than their moist apple danishes and tasty scones were their mouthwatering alfajores: typical Argentinian cookies sandwiched around dulce de leche or jam and covered in chocolate or icing. 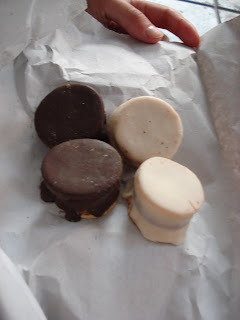 Alfajores were our second favorite discovery in Buenos Aires after empanadas. We relied on these little meat pies for sustenance as snacks or meals throughout our stay. They were always easy to find as restaurant after restaurant advertised "pizza y empanadas". And we ate a lot of pizza, too, although that was not as delicious. It seemed to be the standard practice for pizzerias to use prebaked, Boboli-like crusts instead of making the pies from scratch. But Argentina isn't known for its pizza--it's known for its beef! The mini lomos (steaks) we had at Rustico in Palermo Viejo were absolutely melt-in-your-mouth. We didn't know beef could be so tender--and especially not at $6 a plate. Argentina's other great claim to fame is, of course, tango! Our first attempt to see some dancing was at Lo Roberto, which was recently named a historic bar by the national government and is known to be a great place to see authentic tango for free. Unfortunately no performers showed up the night we went, but the floor to ceiling shelves of dusty bottles made for a neat atmosphere to finish off a bottle of $4 red wine. 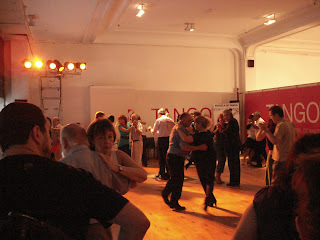 Luckily for us, a huge tango festival and competition coincided with our stay. We took in a glorious afternoon of tango at the Harrod's cultural center on the Florida pedestrian street with professional musicians and dancers on stage, tango-ers of all levels strutting their stuff on the dance floor, and even joining in a lesson ourselves! Lets just say you shouldn't expect to see us on Dancing with the Stars anytime soon. On our last day in Buenos Aires we did what we were still bitter about missing in Rio two years ago: we went to a South American soccer match! It was a high scoring, back and forth affair between the home team, River Plate, and a club recently promoted to the primera division, Chacarita. 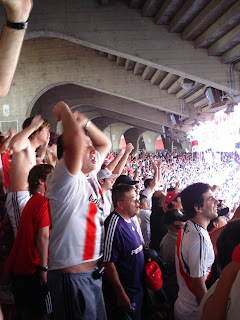 In the final five minutes River Plate's star player scored a dramatic goal that sent the crowd into a singing, shirt-waving hysteria and put River ahead for good 4-3. We were kept penned in the stadium for nearly half an hour after the match to allow for the visiting fans to exit first without incident. Which was probably a good thing because Katrina was looking for a fight. View more pictures from Buenos Aires here. Hi guys, This a is really complete work regarding Argenina. 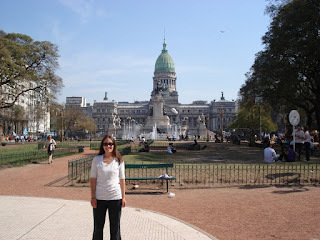 I've first heard some of the places that you mentioned while a was checking an Argentina travel guide. Great blog. I was wondering how many days you spent in each place in Argentina, as I am planning a trip for my partner and me in November, and your trip appeals to me. and in my opinion recommend to my friends. I'm confident they'll be benefited from this website.